The day started out with an intern breakfast for all of Columbia. I went and grabbed a bagel and some orange juice, I met an intern from China who works at the engineering library?? I think. She’s working on building a webpage. I also met her supervisor, but I mostly just went for the food. I stayed at Butler to look at a book in the stacks to see if it would work as research material for Baba collection. It was interesting, but it doesn’t help much. I’ll put it in further resources. It had an essay in it on how difficult it was for Hindu’s to convert to Christianity and to leave behind all the traditions of their fathers. It was an anthropological text, but it fit into describing some of the issues that Baba himself went through trying to overcome the traditions of caste, family and religion on his path to becoming a Christian. Dube, Saurabh. Stitches on Time: Colonial Textures and Postcolonial Tangles. Durham: Duke University Press, 2004. Print. I finished my research for final paragraph on FA for ABC, got it typed out and submitted it to Brigette and Ruth Tonkiss for final review. I also talked with Brigette about the Baba collection and she said that I could forgo writing out a work plan for the collection since it only consists of one book and that I should just dive into the finding aid. I retrieved a pamphlet (another version of his autobiography translated and edited by someone else) from the Missionary Research Library Archives and finished researching Baba on the web. After realizing that I should just use the regular version of Baba’s name I was able to find quite a few resources. It turns out he was a prolific writer. I wrote the biography of Baba and the scope and contents note. I finished everything but the photo and the further sources, before I ran out of time and had to leave. Even though I wasn’t finished with it completely I forwarded it to Brigette, so that she and Ruth could look at it and I would be able to make corrections when I came back on Friday. Greenwich Conference on Church Union, 1946 – 1959: Letters, minutes, reports, studies. In the email Brigette let me know that someone had requested the material so they were trying to get this done instead of the other collection she was going to give me. She also gave me some direction on other things I could do in relation to this unprocessed collection. “As you know, the material we are working with went through the water disaster and some/all of the material was separated – we are recreating the collections. I know there is FCC stuff in the UNP (other unprocessed collections). If you want to do a keyword search on the document and make a note of what we need to pull, you will find the file at: Burke Staff: Archives: Kamsler, Brigette: MRL: Sources: [MRL Unprocessed Boxes Survey.] Do a keyword search for federal and you will find 2-3 things at least. You could also try searching for FCC. The important thing to note from the excel file is the location, box number and components. We will pull this material next week. I looked very briefly at this information. 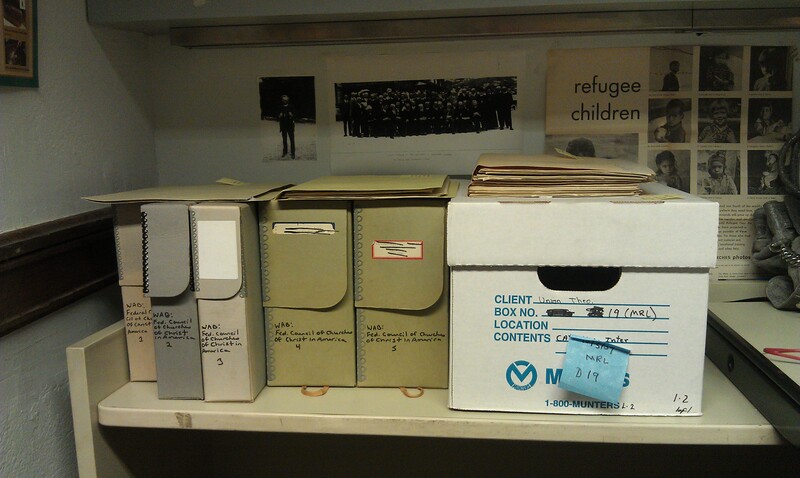 The finding aid from the Presbyterian Historical Society is HUGE!! I made a very cursory glance at the material at my desk, but since I had to finish the other two finding aids I turned my attention to those. I quickly looked at the feedback on the ABC collection from Ruth and all she wanted me to do was add links to the FA for the CLIO records for the books that were separated out of the collection. I resubmitted it to both Brigette and Ruth. I also looked at the feedback from Brigette on the Baba collection. She only changed a few things on my Biography, taking out some colloquial portions of the text. I added a photo and made the changes as per Brigette’s request. I also looked up some additional sources and again almost finished the FA just minus a few citations for those additional sources before I ran out of time and had to leave. I took a few quick photos of some pages of the Autobiography so I would have quotes for a blog post about Baba.